Otwock is the name of both a Warsaw suburb and the new contemporary art initiative that it houses. It’s also the location of Polish sculptor Mirosław Bałka’s childhood home, which, in the 1990s, he renovated into a private studio. In 2011, with the curatorial and administrative support of Open Art Projects, Warsaw, Bałka launched a multiform initiative to bring international contemporary artists to Otwock to produce site-specific works. Analogous to its binary title, Otwock is an experiment in collapsing the divide between the site and the act of production. Bałka’s work often represents post-War Poland as a landscape of the miserablist imaginary: economic depression, Catholic dogma and the lingering traumas of the Holocaust make their requisite appearances. Otwock in particular seems exemplary as a site for the study of material memory. Wandering through the streets, the town’s history is legible through the overwhelming frequency at which derelict or repurposed architectures appear. Many of these were built at the peak of the town’s popularity as an interwar health resort – the climate was supposed to help remedy respiratory diseases. After Nazi occupation, in which three quarters of the town’s population were killed or transported to Poland’s death camps at Treblinka, the ambitious infrastructure built for therapeutic retreats and medical institutions fell into disuse. In the years following the fall of the Berlin Wall, a construction boom saw the city centre’s historic but dilapidated commercial pavilions razed in favour of cement foundations for a shopping mall that was never built. The town’s central square is currently a long-abandoned construction site. Balka has a personal – perhaps sentimental – investment in acquiring both an audience and some posterity for the contemporary state of his childhood home, particularly those more poetic elements of it that will likely disappear unrecorded. This distinctive local landscape is crucial to reading the works created by artists invited to Otwock in terms of their engagement with site-specificity. Site-specificity or site-responsiveness often enjoys the critical allure of a panacea for the awkward hierarchies inherent in international artists making work for an international contemporary art audience rather than a local one. This is perhaps most obviously exemplified in the case of biennials outside of metropolitan art-world capitals, where site-specificity operates either as a form of critical engagement, or an attractive alternative to it: if the work is married to its location, artists and organisers can more readily justify interventions in communities of which they are not part. This is not necessarily the case in Otwock, where Bałka has a personal – perhaps sentimental – investment in acquiring both an audience and some posterity for the contemporary state of his childhood home, particularly those more poetic elements of it that will likely disappear unrecorded. These surface time and again in his own practice; his sculptural, installation and video works draw on memories of the town and regularly recontextualise objects originating from his Otwock studio: glass, cord, soap and hair appear alongside industrial, minimalist and monumental structures. In so doing, the works manufacture unexpected meetings between the bodily and the industrial, the intimate and the institutional, between private and public record. 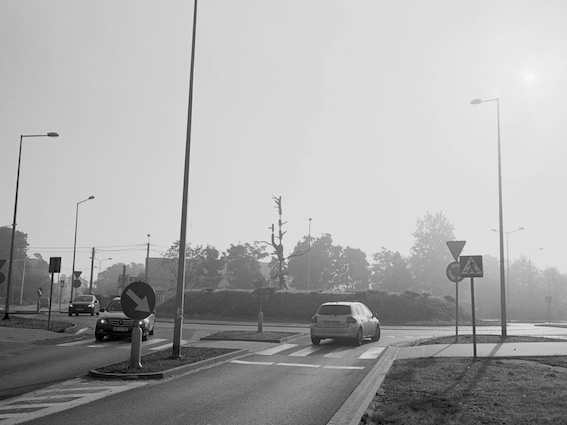 The impetus to bring international artists to Otwock seems to have occurred organically: not necessarily to multiply practices mirroring Bałka’s own, but to invite alternative considerations of a shared time and space. The site’s ongoing material transformations perhaps form a parallel to a national program of collective forgetting – a pointed disregard for the material remains that bore witness to the violence and occupation that constitute Poland’s recent history. With curator Kasia Redzisz, Bałka has designed a non-profit artist-led initiative that’s neither a residency, an exhibition platform, nor a commissioning body proper (the work produced in Otwock stays, in general, with the artist). Instead, the project’s structure is open and dynamic, with artists working in tandem with the organisation to think through exactly what kind of work they want to make and how best to execute it. Every year, Redzisz and Bałka invite artists ­ – in 2011, three individuals; in 2012, two; in 2013, an artist duo – to spend time in Otwock, and to respond by producing site-specific work. In each instance, the processes of both production and exhibition are adapted according to the nature of the work. With limited public funding and incentive beyond the openness of the brief, one must imagine that the artists invited to Otwock are attracted to the prospect of working with or alongside the mythology Bałka has afforded it. Following a methodology not dissimilar to Bałka’s own, site-specificity at Otwock generally manifests itself as a careful deliberation on how experience is organised in space. In its first season, Otwock’s three invited artists – Anna Molska, Lara Almarcegui, and Charlotte Moth – set a melancholic tone, each dealing with the sense of disuse that pervades Otwock. Molska’s The Welcome Sign (2011), a seven-metre-tall sculpture constructed from scrap metal and pine left over from the recent clearance of nearby woods, stood for over a year at the roundabout intersection that serves as the town’s most visible point of entry. The works of Almarcegui and Moth considered the visible, widespread evacuation from and decay of historic residential properties in contemporary Otwock, especially the wooden villas, summer homes and sanatoriums in the Swidermajer style, an idiosyncratic, late-nineteenth-century architecture for which the town was known. Because renovation of these structures is generally prohibitively expensive for residents, and because of bureaucratic formalities that make demolition equally difficult, many of these houses remain standing in a state of decay (or burn down in suspiciously convenient accidental fires). Almarcegui catalogued the official process of demolition in text and photographs in Demolition of a Wooden House (2011) and subsequently published this account in a local newspaper. In Moth’s Villa Surprise (2011), the artist photographed an abandoned house in Srodborow – a neighbourhood populated by the Modernist villas of a pre-War elite – with the intention of reproducing an enlarged photograph on an aluminium structure adjacent to the house, creating a mirror image. However, the house was demolished in the interim between when the photograph was taken and when it was installed. Whereas the original design of merely producing a mirror image suggests the difficulty of entering into this particular historical narrative, the work as it was eventually shown – the enlarged photograph positioned next to where the house once, but no longer, stood – becomes a relic of, and monument to, that closed circuit of history. Otwock’s second season saw a shift to a slightly older generation of artists whose works in Otwock didn’t so much document conditions of ephemerality as create them. Tacita Dean’s Duck Brush (2012), a found series of antique postcards representing fairytale characters, on each of which Dean has hand painted an image of a white, duck-shaped clothing brush, were exhibited in an Otwock school. 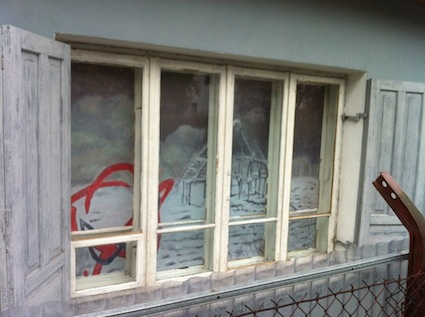 Luc Tuymans installed Die Nacht (The Night, 2012), a painting of a frame from Hans-Jürgen Syberberg’s 1985 film of the same name, in the window of Bałka’s childhood playroom; it can be viewed only from the street. More extravagant, though more ephemeral, was a second work by Tuymans, Ten (2012), an intervention at Zofiówka, a former mental hospital, which involved the artist filling one ward of the now-defunct facility with hundreds of black balloons. Like much of the late nineteenth- and early twentieth-century therapeutic and medical architecture that constitutes Otwock and its environs, Zofiówka was repurposed multiple times by the various political actors of Poland’s recent history. The most gruesome of these occupations occurred in World War II, when the hospital became an extension of Otwock’s Jewish ghetto. A number of patients were starved to death under the Nazi’s Aktion T4, the eugenic campaign under which hundreds of thousands of mentally and physically disabled adults and children were summarily murdered.1 In the decades following World War II, the compound housed a number of Polish socialist youth organisations, a sanatorium for tuberculosis patients and finally a hospital for the mentally ill before it was eventually closed. Today the grounds lie fallow, and a few mouldering structures, now covered in graffiti, are accessible on foot. 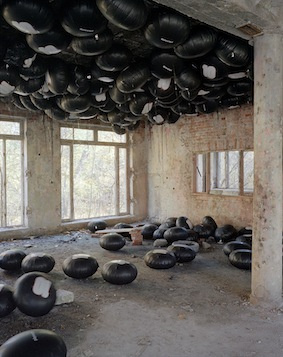 Ten’s balloons filled a room in what remains of the ward for the opening of Otwock’s public programme. As these projects evidence, it is difficult to tread lightly in such contexts, and the works produced in response to the site of Otwock deal in a currency of recurring signifiers of loss, decay and the passage of time: abandoned buildings, empty lots, ruins, rituals no longer observed, stories no longer told. It is from this memorialising aesthetic that the third and most recent season at Otwock makes a departure. ‘Nothing About That. Fictional Narratives’ (2013) focused on the current literary scene in Otwock, expanding the project’s curatorial platform to incorporate contributions from authors and historians as well as visual artists.2 Loyal to a literary nomenclature, the participants (including artists, Wojciech Bąkowski, Jos de Gruyter and Harald Thys, and Aleksandra Waliszewska) were described as ‘authors’ and ‘protagonists’. De Gruyter and Thys’s sculptural series introduces some tragicomic levity. They describe their project as having its origin in two apocryphal moments. The first was when as young art students in Belgium, they saw at a train station two men, the drunkest they’d ever seen, they said, laughing, covered in stains, their pants hanging low around their waists. The second was on their initial visit to Otwock decades later, walking at night with Balka, when a car drove towards them very quickly, sped up as it came closer and veered in their direction before turning a corner. As it drove away, de Gruyter and Thys saw two men inside, laughing and drinking, whom they instantly recognised as the same men from the train station years earlier. Or so the story – in keeping with this season’s literary theme – goes. Confronted by this stock character – the drunk, laughing male – de Gruyter and Thys re-created his appearance on the bodies of sculptures they affectionately titled ‘puppets’. Anthropomorphic in shape and in scale, the sculptures are outfitted in cheap, dirty jeans, ripped and poorly mended polyester jackets, and off-brand, industrially produced athletic wear, with their bodies – faces, hands, and feet – fashioned out of stuffed hessian. Elements of the sculptures are equally theatrical: the outsize stitching on the torn and patched clothing is so cartoonishly ragamuffin that it resembles the outfit of an indigent far less than it would a professional costumer’s rendering of one. Jos de Gruyter and Harald Thys, The men from the underground, 2013. 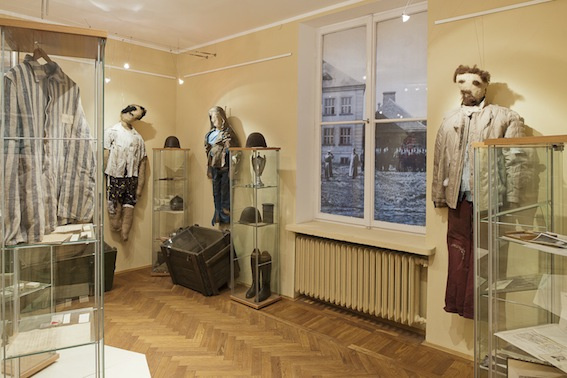 Installation view, ‘The men from the underground’, Muzeum Ziemi Otwockiej, Otwock. Photograph: Błażej Pindor. Courtesy the artists and Open Art Projects. The exhibition of these figures at Muzeum Ziemi Otwockiej, the regional museum,4 read like one of de Gruyter and Thys’s videos – the works for which they are perhaps best known – waiting to be animated. Although rendered as caricatures, the subjects of the work here are not being held out for ridicule. Rather, in re-positioning them from the peripheral space they normally occupy (by their own design, according to the artists’ text) to a discursive focal point where such positions might be understood as critique, de Gruyter and Thys celebrate their refusal to participate in and support existing structures of power. This shift, in turn, also attends to the friction between private and public narratives; the marginal experience that Bałka seems to fear is the least likely to be documented. In Otwock, the question of who is allowed to write cultural history is still active in light of the speed at which its past is becoming less and less material.